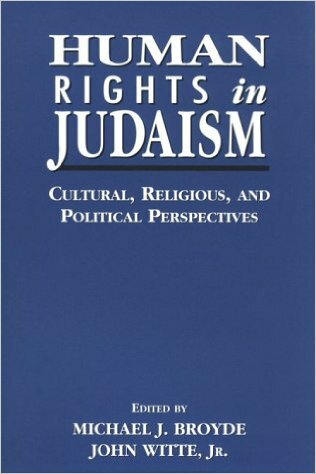 Book: Human Rights in Judaism - John Witte, Jr. Written by some of the most highly regarded scholars in the field, the essays in Human Rights in Judaism: Cultural, Religious, and Political Perspectives examine the remarkable contributions that Judaism has made, and can make to the theory, law, and activism of human rights. Each chapter focuses on a different aspect of Jewish tradition and human rights. David Novak, internationally acclaimed scholar in the field of Jewish law, ethics, and theology, explains the approach to human rights as it is presented in Judaism’s basic texts. Michael J. Broyde, Senior Lecturer in Law and Director of the Project on Law, Religion, and the Family at Emory University, addresses the problems of inclusion and exclusion from the religious community. Michael S. Berger, Assistant Professor of Religious Authority and Ethics in Judaism at Emory University, and Deborah E. Lipstadt, author, educator, and widely respected authority on Holocaust studies and American Jewish history, examine the role of women in the Jewish community, noting those areas where Jewish tradition has achieved a balance of its various ideals and those areas where problems remain to be solved. Asher Maoz, Senior Lecturer of Law at Tel Aviv University and an expert on Israeli law, human rights, and family law, discusses the issue of religious freedom in Israel, while Irwin Cotler, distinguished authority and advocate of international human rights and constitutional protections, looks at the role Jewish Non-Governmental Organizations in North America play in protecting and promoting human rights. In the Talmud it is taught that “whoever saves one life, it is as if he saved the entire world.” Taken together, the essays in this collection paint a vivid picture of how Jewish tradition teaches its followers to respect the sanctity of every individual and to save many “worlds” through the preservation of human rights.